Populate your Star Wars universe with a whole range of potential allies, enemies, and contacts. 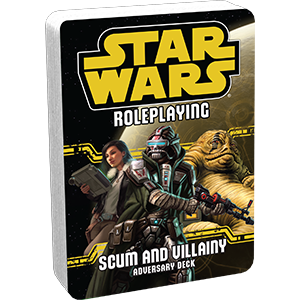 Three new Star Wars® Roleplaying Adversary Decks each come with twenty cards, representing different NPCs drawn from the Edge of the Empire™ Core Rulebook, the Age of Rebellion™ Core Rulebook, or one of their supplements. Adversary cards work with all three of the Star Wars roleplaying systems and present all your adversaries’ key statistics and information in an easily accessible fashion. Meanwhile, their art and description text help you set the scene and flesh out your NPCs’ personalities. On some planets, the criminal underworld is cautious, congregating only in secret. On other worlds, it operates in the open, wielding its influence like a blunt instrument and daring the forces of law and order to oppose it. The Scum and Villainy Adversary Deck introduces twenty NPCs that you can use to populate your campaigns with fleshed-out gangsters, criminals, and outlaws – both notorious and amateur. Smugglers, slicers, arms dealers, hired thugs, and Hutt crime lords all mingle among the gritty congregation of characters that this adversary deck places at your fingertips. This is not a standalone product. A copy of the Star Wars®: Edge of the Empire™ Core Rulebook, Star Wars®: Age of Rebellion Core Rulebook, or Star Wars®: Force and Destiny Core Rulebook is required to play.